In 2007, I attended my first the Work That Reconnects workshop at Sharpham Estate in Devon. For the first time I met people who were not afraid to express how they felt about what was happening to the planet. I was touched and moved to take my training further. I got more experience of this work including a facilitator training and have since run workshops in a variety of settings. The Spiral is a central element of the Work That Reconnects. See The Work That Reconnects page. In the final stage of the work, Going Forth, participants are encouraged to vision their own project for healing and recovery of the earth and Earth Beats was always my going forth project. Although it didn't have a name at that time. That came later.. The name Earth Beats evolved from a contraction of the Heart Beat of Mother Earth. The name came years before Earth Beats was finally born in its current format in October 2012 after a pilot during the Creative Community Devon gathering at Landmatters eco community in the summer. 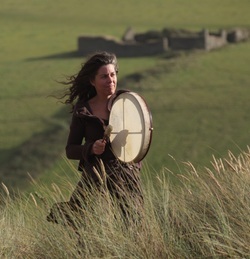 Earth Beats is inspired by Gabrielle Roth’s 5Rhythms and Joanna Macy’s the Work That Reconnects (WTR). And in the autumn of 2014 following a professional training I started adding techniques from Open Floor International set up by the core teachers of 5Rhythms Kathy, Lori and Andrea plus Andrea's partner Vic. Other inspiration comes from Tantra, the Wheel of the Year and Buddhist meditation practice. In June 2017 I became an Open Floor conscious dance teacher with Open Floor International. ​.Check out the wonderful video below: https://vimeo.com/150950235.